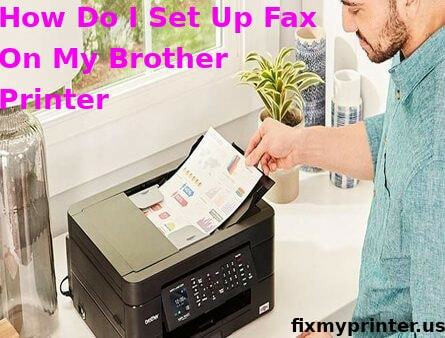 To set up fax on your Brother printer, first, you should set up an answering machine connected to the printing device. Having a fixed answering machine helps you receive faxes automatically when sent by the receiver. Before you send a fax, there are a few fax settings to be aligned and confirmed on your Brother printer during the fax setup process. You require a telephone cord to set up a fax on the same and it should be the one provided by the printer manufacturer. To resolve the query of “How do I set up fax on my Brother printer” quickly, here are the steps that you need. Set up the receiving mode using the distinctive ring number for faxes. Check whether your printer contains Voice Mail Service as a receiving mode. Have an answering machine for your telephone line to connect to your Brother printer. Choose the External TAD mode if you are attaching an answering machine as above. Select Fax only if you have a dedicated fax line. Checkmark the Fax or Tel mode for using the telephone cord alone. Go with the Manual mode if you want to operate the fax manually. Ensure that you save and apply the settings that you choose. Step 1: To connect the answering machine to your Brother printer, first, grab the telephone cord provided by the manufacturer and connect one side of it to the LINE-end and the other side to the direct telephone jack on the wall. Take the cord of your answering machine and connect the free end to the EXT-end of your Brother printer. Fix the number of rings to 4 or less in the answering machine will helps to work for the query How do I set up fax on my Brother printer. Step 2: You can also record the outgoing message on your answering machine for up to 5 seconds before you start speaking. After this, set up the receive mode on your fax-enabled Brother printer. Press the Fax icon or option depending on whichever is available and tap Menu. Step 3: With the Up or Down arrow key, first, view Fax and then tap OK. Again, press the Up or Down arrow key and look for Setup Receive, and then press OK. Now, to view the Receive mode, navigate using the same Up or Down arrow key and press OK. In case you cannot fix your preferred Receive mode, set the receive mode as Distinctive Ring or BT Call Sign, or the Fax Ability Feature is set to OFF. Step 4: Now, use the arrow keys again to select External TAD as the receive mode and press OK. Tap Stop/Exit. The fax is set up now; to send faxes, these are the set of instructions to be followed. Step 5: Ensure that your Brother printer has a dial tone. If the dial tone is present, then take the document that you wish to fax and place it on the scanner glass or ADF based on the feature that your machine supports to setup fax on Brother printer. Step 6: Check whether the fax preview is set to ON/OFF. If it is ON, then Press Fax followed by Sending Faxes. In case it is OFF, then enable it by pressing the Fax option on your printer. Provide the fax number for sending the fax on your printer’s screen and then press Fax Start. By pressing the Fax Start option, your printer scans and faxes the document to the recipient. The above steps should be followed if you are faxing through ADF and process on “How do I set up fax on my brother printer”. Step 7: To fax from the scanner glass, keep the document with the faxing side facing down the scanner glass. Tap the Fax option on your Brother printer and then press Sending Faxes. Key in the fax number that you wish to send the fax to. Step 8: Press the Fax Start option and choose Black Mono for regular fax, Color in the Color setting for Color fax. Tap Yes to confirm the changes and press OK to setup fax on Brother printer. Step 9: If you want to fax multiple pages, then you should scan the pages first and then fax them as per the options provided above. Note that while faxing through scanner glass, multiple faxing is only possible manually. Step 10: After you complete sending of faxes, to stop the fax, press No on the screen when displayed will determine the successful process of “How do I set up fax on my Brother printer”.